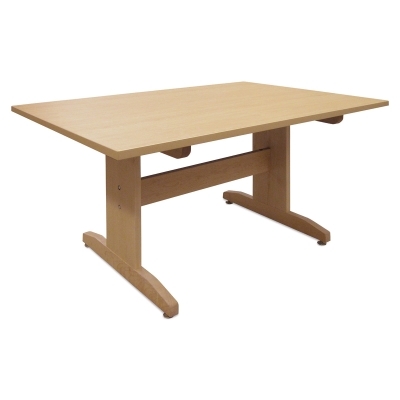 This is a good-looking, multi-purpose art table that makes a sturdy and attractive platform for student projects. Its base is mortise-and-tenon jointed for strength and durability. Heavy base components and wide feet contribute to excellent stability. The feet are fitted with adjustable floor glides in each corner. A double-bolt lower leg spreader and an upper leg spreader prevent wobbling. 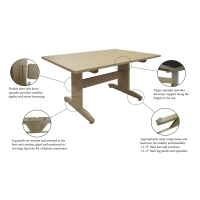 The top is made of 1¼" thick, heavy-duty, maple-grained laminated plastic over particleboard. It has nick-resistant 3 mm PVC edgebanding.